Greenwald: Supporting U.S.-Russia Relations Should Be Encouraged, Not Viewed as Sign of Treason | Democracy Now! 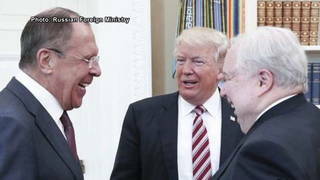 President Trump and Secretary of State Rex Tillerson are meeting with Russian Foreign Minister Sergey Lavrov at the White House today, only one day after Trump fired FBI Director James Comey in what many see as an attempt to squash the FBI’s investigation into Trump’s ties to Russia. For more, we speak with Pulitzer Prize-winning investigative journalist Glenn Greenwald. AMY GOODMAN: So, they—Donald Trump fires the FBI director. Many say it’s because he is investigating—and he did just recently say he was investigating—the Trump White House and possible collusion with Russia around the elections. And today, President Trump is meeting with the Russian foreign minister in the White House, with Lavrov. GLENN GREENWALD: So, I think, you know, this is—as a journalist and as kind of a citizen, this is part of—been what has bothered me about this whole scandal from the beginning. And I think Noam Chomsky was on your show maybe last week or the week before and made this point very well, which is, unfortunately, what this scandal has done is it has taken what ought to be an aspiration that we all share as Americans, which is to find a way to improve relations with this incredibly powerful, nuclear-armed state, with whom we have a history of decades of animosity with, whom we’ve almost come to civil war—to nuclear war, and hope that we can—and look at better relations not as indicia of disloyalty or treason, but as something that we all ought to support. And, unfortunately, what this scandal has done is it has pressured Trump to prove that he is not a lackey of the Kremlin by ratcheting up tensions between Moscow and Washington. And I think that people are telling the truth when they say relations between the two countries are as low as they’ve been in many years, maybe since the Cold War. So, we ought not to let these legitimate questions surrounding Comey and Russia and interference in the election turn into something nefarious and sinister efforts to have normal diplomatic relations between the United States and Russia. We still ought to encourage that. NERMEEN SHAIKH: Well, I mean, Trump’s—as you’ve pointed out earlier, Trump’s sacking of Comey will obviously lead to greater speculation, if not confirmation, that Russia was involved in some way in the 2016 election in supporting Trump. AMY GOODMAN: And that Trump decided that the huge firestorm that would happen now was worth the trade-off, because what he didn’t want to happen was him getting at the truth. GLENN GREENWALD: Yeah, I mean, I think that that’s the obvious perception that, even if you’re trying to wear a lens of thick skepticism through which you’re viewing these events, you have to take into account. You know, but on the other hand, I still think that it’s an extremely dangerous situation when you have two countries like the United States and Russia, drowning in a nuclear-armed arsenal, to have it be politically radioactive on both sides, to be able to have constructive relations. And so, I think it’s imperative that we keep these two things separate. AMY GOODMAN: So, let’s talk about the possible replacements for the FBI director—for example, Rudolph Giuliani, for example, New Jersey Governor Chris Christie. GLENN GREENWALD: So, I think that, you know, obviously, the reason why the firing of Comey is so controversial, even among Republicans, among pretty much everybody, is because it creates the perception that the FBI has lost its independence. So the last thing that Trump can do to tamp down that perception is to appoint somebody who’s viewed as his lackey. And there is no more craven, principle-free, corrupt prosecutor that you can think of in the country that Trump could appoint, other than Rudy Giuliani, except perhaps for Chris Christie. Those two are probably the worst possible selections that Trump could make in order to put in charge of the FBI. And I think if he did that, you would start to see a lot more defections, even among Republicans, who would start to view this as a bridge way too far. NERMEEN SHAIKH: Well, Republicans have already criticized him for firing Comey in the first place. But do you think, to go back to my question earlier, that this could be the beginning of the end of Trump’s presidency? GLENN GREENWALD: So, if you study the Watergate investigation, as you alluded to earlier, it began with these lies and these maneuverings that were about a cover-up. But no one really knew what was being covered up, about who knew about the burglary, who had actually planned it. What they knew is that there was lying to Congress, there was an attempt to suppress information. But it wasn’t until evidence of the underlying crime emerged that it really began to threaten the Nixon presidency. That’s what I think has to happen here for this scandal to take the next step. There has been lying by the Trump administration, efforts to obfuscate. This is a huge escalation of those efforts. But until we actually see evidence of collusion, of underlying criminality between Trump and Russia, I don’t think it will threaten his presidency in the sense that it could cause impeachment. But it certainly will continue to impede his ability to do things, and perhaps even cripple his presidency. AMY GOODMAN: Other people mentioned were Ray Kelly, the former police chief of New York; David Clarke, the former police chief of Milwaukee. But then there is the discussion of the current, Andrew McCabe, acting director of the FBI, who was chosen by James Comey in 2016, has now assumed duties and apparently was meeting with the White House. GLENN GREENWALD: Yeah, I mean, remember, the person who appointed James Comey to be the FBI director, notwithstanding his longtime Republican service, including in the Bush administration, was Barack Obama. There’s a tradition of showing that you want to put independent people in the FBI director. And I think there’s going to be a lot of pressure on Trump, even from Republicans, not to make an appointment that takes this event from humiliating to something even worse. AMY GOODMAN: And what you say to those who say, “I mean, the people who are doing the investigation at the FBI will still keep doing it”? GLENN GREENWALD: Right. So there are career investigators at Justice and at the FBI, and that’s why I say there’s no way to fire Comey as a means of suppressing incriminating information. But it’s also true that who leads the FBI, especially under the direction of Jeff Sessions, notwithstanding his recusal, as we’ve just seen, those top officials can hamstring investigations. They can deprive them of resources. They can redirect them in all kinds of ways that we ought to regard as undesirable. AMY GOODMAN: What about your reporting on the FBI’s secret roles, what you’ve started talking about, President Trump inheriting this vast domestic intelligence agency with extraordinary powers? I mean, even as he was putting out the lie that President Obama wiretapped him at Trump Tower, they signed off on a law that would increase the surveillance power of the government. And then you go back to this leak that led to you finding so much about previous FBIs. GLENN GREENWALD: It’s funny. As someone who’s worked on civil liberties as a journalist since the Bush era, the argument I used to make to try and convince Republicans to care about Bush’s civil liberties abuses is to say, “Look, I know you trust George Bush, but imagine Hillary Clinton with these powers.” And then, when Obama was abusing civil liberties, I used to say to Democrats, “I know you love Obama, but imagine Sarah Palin or Newt Gingrich with these powers.” And on some level, having Donald Trump inherit this sprawling surveillance apparatus, this incredibly potent, almost unlimited executive branch, from a framework that was constructed jointly by the Republicans and the Democrats in the wake of 9/11 and even before, is the ultimate vindication of that argument. The problem is, you can’t celebrate the vindication, because it means this incredibly dangerous individual is in now—now is in possession of this virtually [limitless] set of authorities and powers that the Republicans and Democrats together built, thinking that only responsible leaders would exercise. NERMEEN SHAIKH: Well, I want to go back to a comment that you made earlier about Russia-U.S. relations and, of course, the specter of possible nuclear war. Now, one of the sites—Lavrov is meeting Trump today in the White House. One of the possible sites of a direct conflict is, of course, in Syria. Now, both Syria—both—I mean, Russia, in particular, backing the Assad regime, but the U.S., as well, has carried out something like 8,000 airstrikes in the country. Could you comment on what the situation is in Syria and what you see as the possibility of the U.S. and Russia somehow working together, or not? GLENN GREENWALD: One of the ironies of this attempt to depict Trump as this puppet of the Kremlin, both generally and then also with regard to Syria, was that President Obama was actually extremely accommodating of Putin and tried to forge a path of better relations with Russia, both generally, by doing things like refusing to arm anti-Russian elements in Ukraine—remember, he mocked Mitt Romney in 2012 for depicting Russia as this grave geopolitical threat—and in Syria, despite some rhetoric about how we needed to remove Assad. The reality is that the U.S. has engaged in this brutal bombing campaign for years, not against Assad, but against many of the elements fighting Assad, particularly al-Qaeda and ISIS. And so, there have been times when Obama proposed partnerships with Putin, bombing partnerships, where the two countries would work together to bomb agreed-upon targets in Syria. And so, for all the talk about Trump’s Syria policy being this gift to Vladimir Putin because it bolsters Assad in office, the reality is it’s not that much different from what Obama did in Syria or, more broadly, in trying to have a good relationship with the Kremlin. And remember, Obama never bombed Assad, and Trump did. So, it’s sort of an irony that it’s Trump who gets depicted as having a pro-Russia policy in Syria. AMY GOODMAN: And then, moving to Afghanistan, Trump weighing sending thousands more troops, expanding the war in Afghanistan? GLENN GREENWALD: You know, it’s just such a somber reminder of the fact that while there are huge differences between Republicans and Democrats, ones that matter to huge numbers of people, on things like abortion and marriage equality and healthcare, there are also huge areas of continuity, where it makes no difference who ends up winning. And what’s so remarkable is the Afghanistan War is now in its 17th year, under its third president. Obama—Trump is the third president to escalate it, after campaigning against it. And we barely ever talk about it anymore. AMY GOODMAN: Well, we’re going to keep talking about this after the show, and we’re going to post it online at democracynow.org. Glenn Greenwald, our guest for the hour, Pulitzer Prize-winning journalist, founding editor of The Intercept. And that does it for our broadcast. I’ll be on the road tonight, speaking at Seattle Town Hall in Washington state at 7:30. Then, back to New York Friday, I’ll be speaking at The New School at Tishman Auditorium on 5th Avenue at 7:00 p.m. Saturday, I’ll be in Olympia, Washington, at Capitol Theater at 11:00, then at Powell’s Books in Cedars Hills Crossing in Beaverton, Oregon. Then I’m off to California, stopping in Eureka, Berkeley, Santa Cruz, Palo Alto, San Diego, Los Angeles, Santa Barbara. Check our website.